For the fourth time in four games, Toronto and Miami played a boring, ugly slog of a game where entertaining chunks only ever intermittently floated up through a soup of mediocre, dumb basketball. A brief summary: The two teams combined for 42 percent shooting and 26 turnovers; Goran Dragic getting hit in the face was the best highlight; Kyle Lowry and DeMar DeRozan combined for 19 on 6-for-28 shooting; The basketball tried to make a desperate break in the name of freedom; Dwayne Casey drew up this at the end of regulation. Okay. Anyway, Dwyane Wade was the only player in the game to clear 15 points. 11 of his 30 came in the fourth quarter and overtime, and he keyed a late Heat comeback out of a nine-point hole. There were a few moments towards the end of the game, like this vintage hanging floater to send the game to overtime, where he looked ten years younger and was able to glide around and through teams of defenders with a laconic ease. Fittingly, he put a cap on the game with a steal and slam. The series will now head back to Toronto tied 2-2 with both starting centers out for the last three (probably) games. The Lowry-DeRozan pairing keeps finding new lows, but Bismack Biyombo’s springy competence and Corey Joseph’s spark are keeping the Raptors in this series. They missed a great opportunity to effectively end things tonight, but that would have required an out-of-character ability to execute late. For Miami’s part, they’re not much more attractive, even with alleged good passer Josh McRoberts playing 21 minutes. Both team’s skills on the defensive end have dragged this entire series down into a stylistic muck of isolations and end-of-shot-clock prayers. Miami happens to have the best one-on-one ball stopper in the series (even if they are short their defensive rock) and that’s been the difference in a tightly-contested series. If Toronto figures out a way to get their backcourt playing functional basketball, they’ll have the advantage. 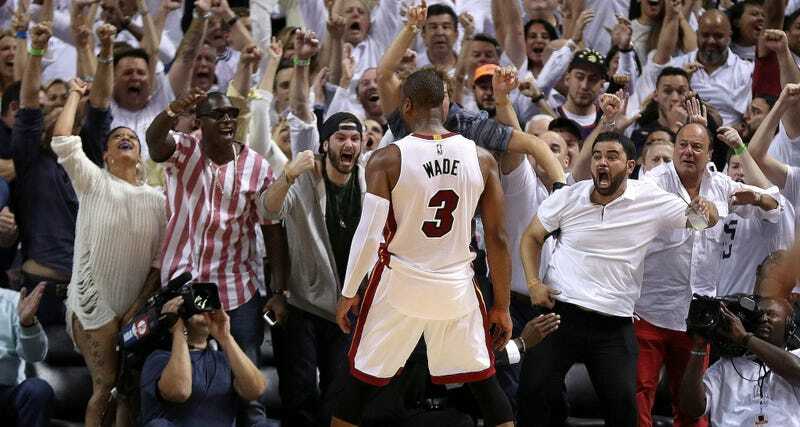 Either way, whoever makes it out has a fiery death machine to face, and as good as Dwyane Wade has been all playoffs, nobody on this side of the bracket is getting past the Cavs.